had begun using a more northern route to avoid patrols in the Gulf of Oman and the Arabian Sea. 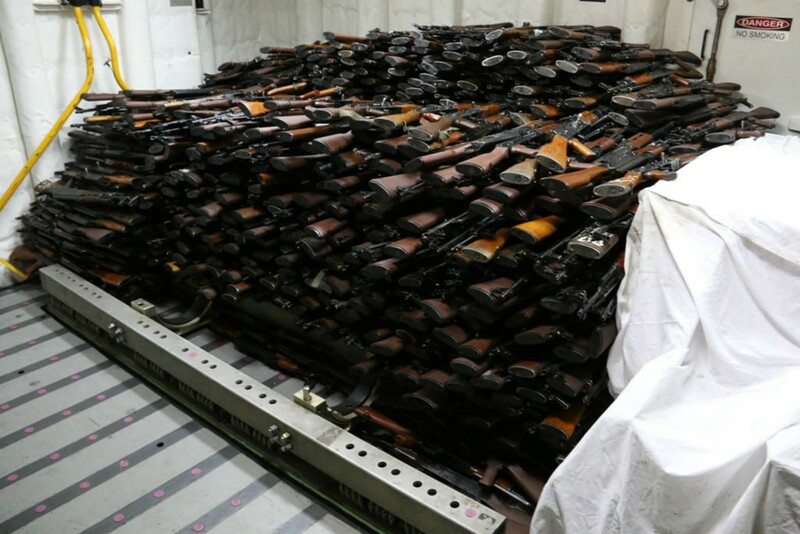 Analysis: Operating out of key Iranian ports, the IRGC rendezvous with dhows in the northern Gulf for the transport of weapons and other goods through Gulf waters and out to the Arabian Sea. These dhows usually end up in the Gulf of Aden, where other networks transport the weapons into the local black markets on both sides of the Bab al-Mandab. Although Kuwait denies such activity, it is known that in the northern Gulf, Kuwait is unable to monitor and protect its maritime territory, especially with Iraq’s al-Faw peninsula and Iran next door. Kuwait’s state news agency KUNA cited the foreign ministry as saying that the country has taken the following measures against North Korea: the discontinuation of direct flights to and from Pyongyang; the suspension of entrance visas for North Korean workers and the issuance of commercial licenses; the severance of diplomatic and financial ties with Pyongyang; and the imposition of bans on North Korean imports. These new restrictions came as U.S. President Donald Trump reacted with stronger rhetoric to North Korea’s plans to fire missiles to land near the U.S. Pacific territory of Guam. Analysis: Kuwait’s vacillation on whether to cut off or expel North Korean laborers reflects the country’s uncertainty as to how to deal with the Trump administration’s foreign policy. Kuwait’s move on North Korean workers may serve as a necessary example for other GCC states (Oman, Qatar, and the UAE), where North Koreans work and remit money to the Pyongyang regime. Kuwait’s interior ministry announced that 25 Kuwaiti Shi’ites and one Iranian citizen have been arrested, has always been considerable jostling for rank, and consequently, the health of family members is a crucial issue. It is not clear who is third in line. Lebanon’s Prime Minister Saad Hariri announced that his country will cooperate with Kuwait in the resolution of the Abdali terror cell issue. Members of the group were recently convicted of intelligence links with Iran and the Lebanese militia Hezbollah. The conclusion of a lengthy trial was that Hezbollah had been involved in intelligence, coordination of meetings, payment of funds, and provision of weapons and training within Lebanon. The goal of the Abdali cell was to destroy the basic infrastructure of Kuwait. Following the verdict, Hariri himself traveled to Kuwait, where he condemned the actions of the terror cell and vowed to cooperate to resolve the issue. Analysis: Lavrov’s trip to the region is part of Russia’s reach to act as negotiator between all parties involved in the Qatar crisis. For Moscow, playing all sides is part of the Kremlin’s strategy, aimed at putting Russia in a key position.